A.Visadd.com is a service that is going to display a great deal of advertisements on different websites. They will keep appearing to you all the time and you will not be able to get rid of them unless you erase A.Visadd.com application entirely from your PC. Even though you might disable all those commercials on A.Visadd.com website, there is no guarantee that they will disappear completely. The only really effective solution is to go to Control Panel and then delete the adware or let the reliable antimalware tool do that for you. This advertising-supported application uses ib.adnxs.com advertising domain; thus, do not be surprised if various pop-ups brought by this service appear on your screen. We understand that they might not seem harmful, but the truth is that they still might cause you some security-related problems. You should definitely not risk infecting your system because you might have more difficulties in removing all those threats than you think. In addition, the deletion of A.Visadd.com adware is also very important if you do not want that it keep collecting data related to your browsing habits. Such information might include the amount of time you spend browsing the web, the pages that you visit, the content that you access, and even your search queries. 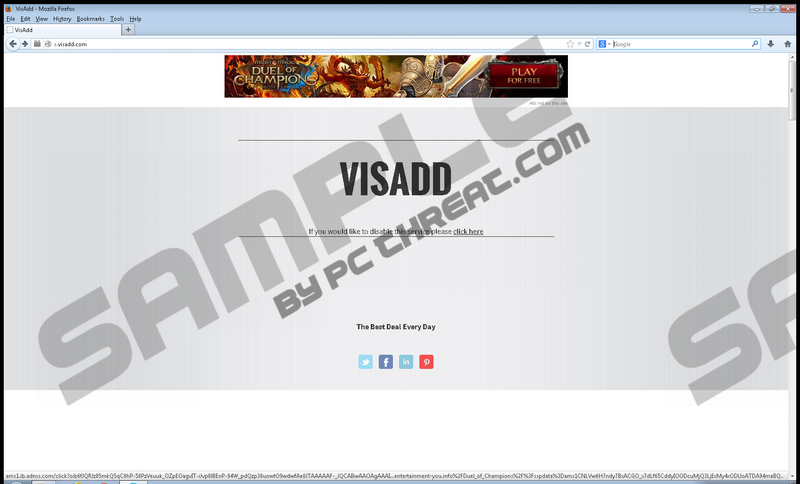 A.Visadd.com software might have entered your system secretly or you might have downloaded it yourself. However, the first variant is definitely more plausible. Our specialists have also found out that A.Visadd.com installer tends to come bundled with Iwebar, JollyWallet, ShopperPro, Sense, and YTDownloader. It is possible to avoid some of them; however, you should always keep in mind two simple tips: you have to read the information provided in the setup wizard carefully and select Custom/Advanced installation every time in order to be able to select those applications that you want to install and un-tick the checkboxes of those that are undesirable. If we have already convinced you that there is no point in keeping A.Visadd.com software on your PC, you should know that you will be able to erase it via Control Panel. However, it is also better to check the list of extensions in order to remove all the components. Even though it might seem that you have erased all the elements of A.Visadd.com, we still highly recommend scanning your computer with a reliable antimalware tool. If you are interested in our opinion, we believe that SpyHunter is the most trustworthy tool. Right-click on the adware program and then select Uninstall. Tap Windows key + R simultaneously. Type in Control Panel into RUN and click OK.
Right-click on the useless program and click Uninstall. Locate the extension, click on it, and select Disable. Select Extensions (you will find it in the menu on the left). Find the undesirable extension and click on it. Locate the extension that you need to erase in the list of extensions. Select it and then click the recycle bin button. Quick & tested solution for A.Visadd.com removal. Hi Luke you could try but you might be better off usnintalling and re-installing the VL edition. Note: if you have the trial installed and purchased the regular retail copy you can just enter the product key and it will allow the program to work beyond the trial period.